Assuming that you have one of the above PBX’s we have setup following guidelines for you to create connection between DIDforSale and your PBX. For configuring our service with 3cx, you need to create three SIP trunks. Two for incoming calls and one trunk for outgoing. 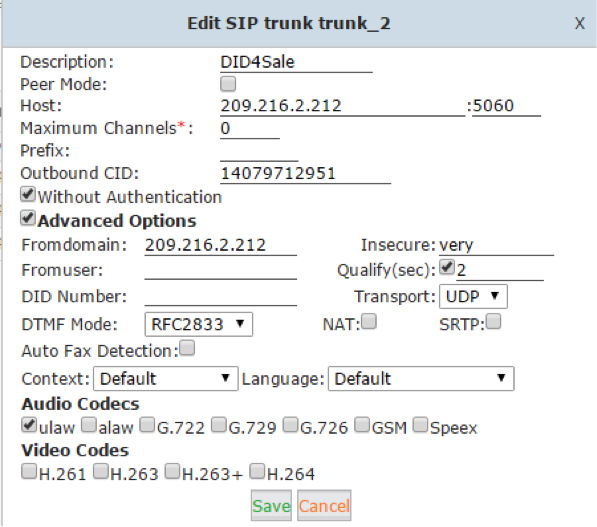 To create a sip trunk, click on SIP Trunks. Add the details as shown in below figure. Select country as Generic and provider as Generic sip trunk. From this menu, select the destination to which the DID number should be forwarded in your 3cx system as show in in below figure. You can send the calls to an extension, queues, ivr, voicemail, fax or to an external number. Click on Next and the next window is for configuring outgoing routes for this trunk. You ca n skip this step as this trunk is only used for incoming calls. Create one more similar trunk by replacing the server hostname or IP in figure 2 with 209.216.15.70. All other settings are similar to the first trunk. After creating the two trunks, try making a call to the DID number and the calls will reach to the destination in your 3cx to which the number is configured. Select country and provider as generic and Generic sip trunk respectively as shown in below figure. You can skip the inbound rule section as this trunk is only used for outgoing calls. From the outbound rule section, add the details as shown in below figure. This will allow you to dial US calls with prefix 1 through our system. Click on finish. The new trunk will be active now and you can start making calls through it. To create an interconnection between your asterisk server and DIDForSale servers, you need to create 4 trunks in your sip.conf file. Two trunks for incoming calls and two for outgoing calls. The above dialplan entry catch all calls coming from didforsale and send it to the extension 1000 in your system. You can change that to forward calls to any other extension or ivr on your system. Change the context name “outbound” in the above entry to the context name of your extensions. Now you need to add a dialplan entry in your server to catch the incoming calls to the DID number. For that go to your freeswitch configuration directory, then move to dialplan/public directory and add an xml file there with any name with the below contents. NOTE: Replace 13043935064 with your DID number This dialplan will route all incoming calls coming to the did number to extension 1000. You will need to reload your acl and xml after doing the configuration. For doing that, go to freeswitch cli by using command “fs_cli” and run the commands reloadacl and reloadxml. 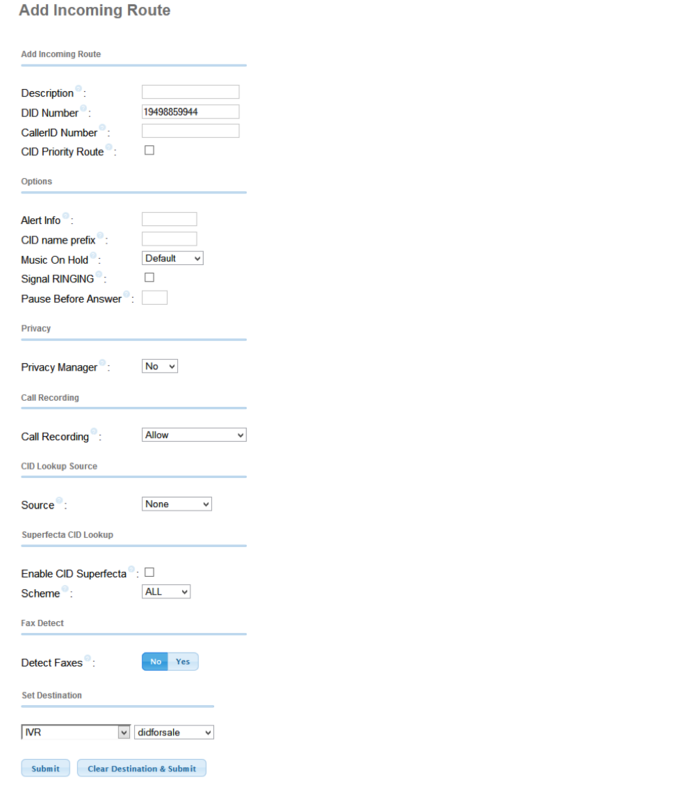 For Configuring Grandstream PBX with DIDforsale, you need to create four SIP Trunks. Two trunks for incoming calls and two trunks for outgoing. 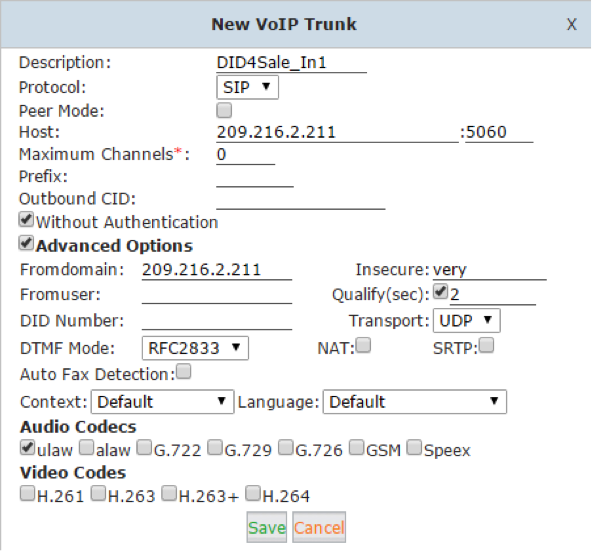 For creating trunks, go to PBX => VoIP Trunks => Create new SIP Trunk. Add the details as shown in below figure Similarly create three more sip trunks with the following IP address 209.216.15.70 209.216.15.71 209.216.2.212 Once all the trunks are added, the page will looks like Now you need to configure your DID number. 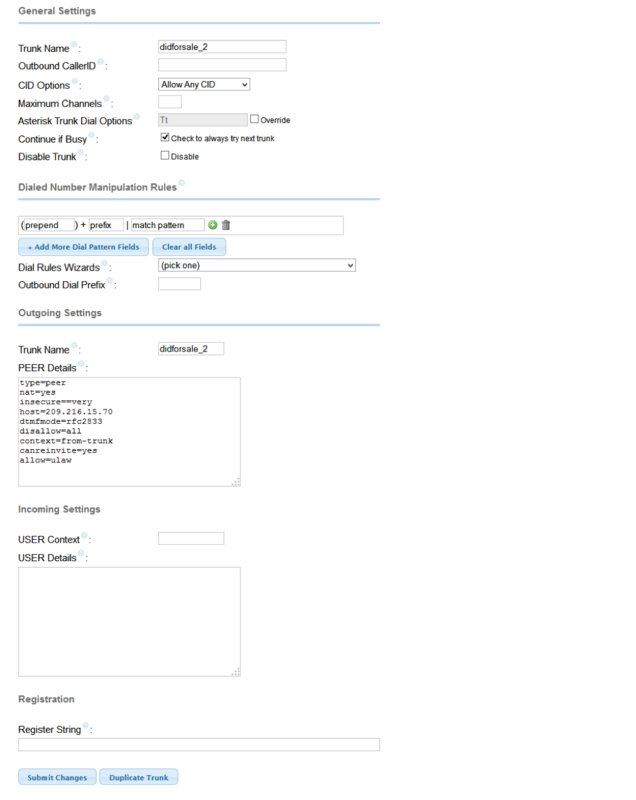 For configuring DID number, go to PBX => Inbound Routes => Create New Inbound Rule and add the details as shown in below figure Now configure outbound routes for sending outgoing calls through didforsale. For outbound routes, go to PBX => outbound Routes => Create New Outbound Rule as shown in below figure Select any one of the outgoing trunks in outbound routes. If you want to do a failover, click the option “click to add failover trunk” on the bottom side and select the second outbound trunk here. Leave other fields as default or blank. 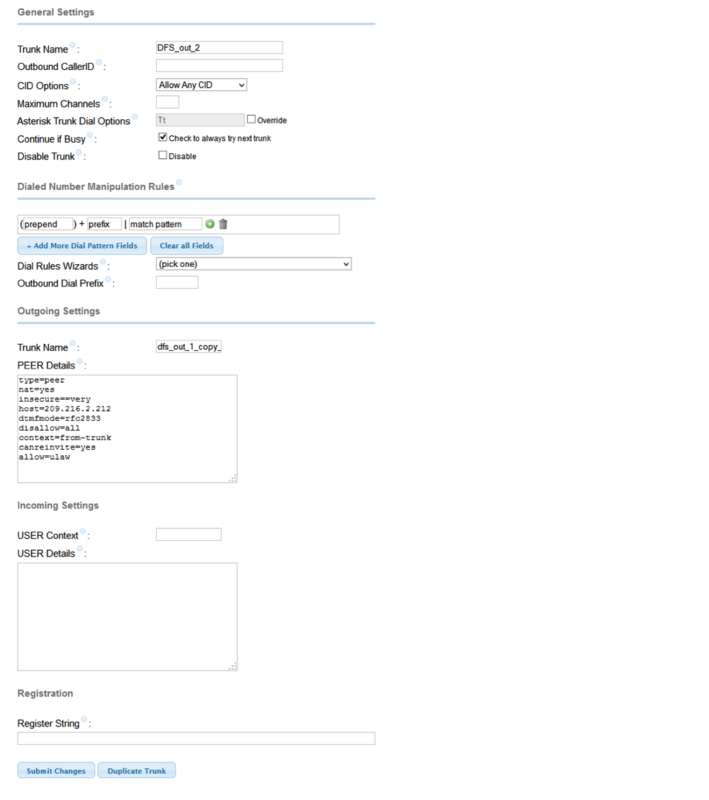 Create one more carrier with same options except the host parameter in Account Entry field. Change the host from 209.216.2.211 to 209.216.15.70 in the new carrier. Now you will have to route the DID number to the extension you want. You can do that by selecting Inbound –> Add a new DID, Add your DID number, and add the extension to where you want to forward the calls coming to DID in the Extension field and submit. 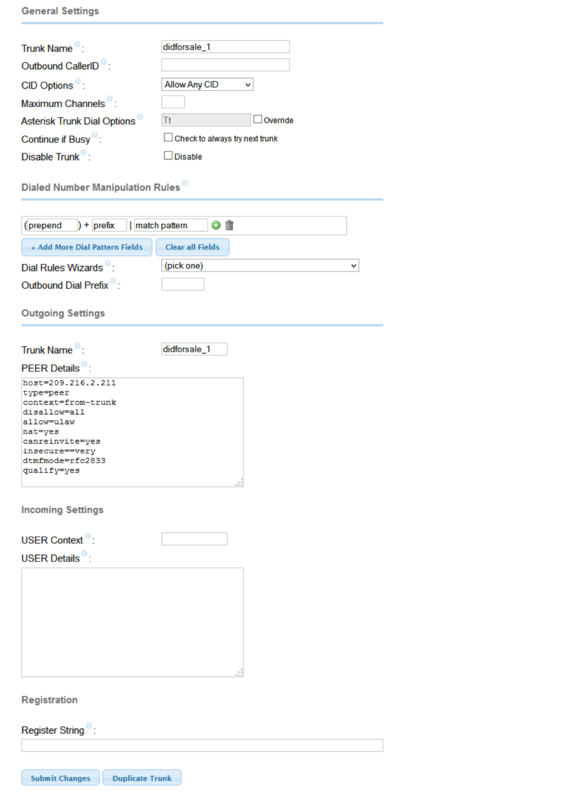 Click “New VoIP Trunk” button to create a VoIP trunk for outbound DIDforSale server. In this case DIDforSale authenticates the subscription using IP address, so we can tick “Without Authentication” option for this trunk. If username and password authentication needed, then do not enable this option and fill in the username and password below. In Advanced Options section, Insecure was “port,invite”, please change it to “very”. And audio codecs please enable ulaw only. If you get both Status and Reachability as green and OK, then you can continue to configure dial rule and dial plan for outbound phone calls through this trunk. If not, then please check the trunk configurations and verify the parameters given by DIDforSale. 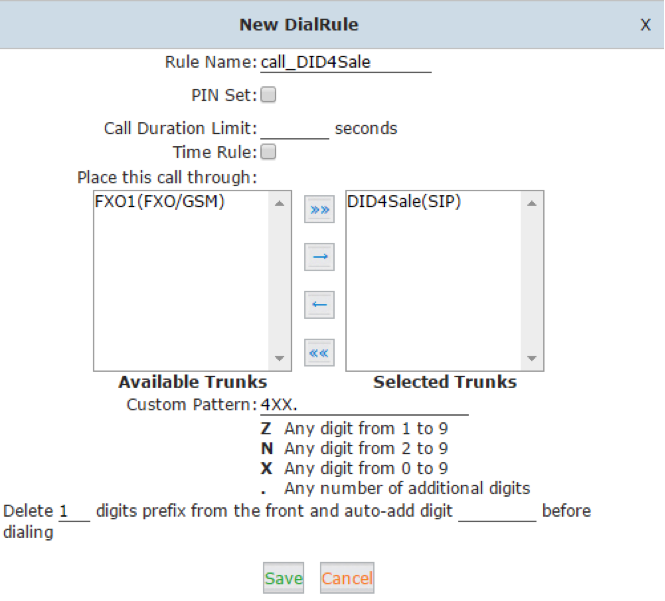 Click “New Dial Rule” to define a dial rule for making outbound calls through DIDforSale VoIP trunk. Make sure the VoIP trunk is in the Selected Trunks field, and define you custom pattern, for example “4XX.”, which means if you want to make outbound calls through the DIDforSale trunk then you need to dial the numbers with prefix 4. For example, if you want to dial 1234567, then you need to dial 41234567. And at the bottom there’s a line “Delete ____ digits from……”, here you need to strip the one digit prefix before send this number out, so you fill 1 here. If you use 2 digits prefix then fill 2 here. To activate this dial rule and let the users be able to make phone calls through this VoIP trunk, you need to enable the dial rule for the dial plan/dial plans. Click Edit button of the existing dial plan: Check the new dial rule just added then the extension users will be able to make outbound calls through DIDforSale trunk. 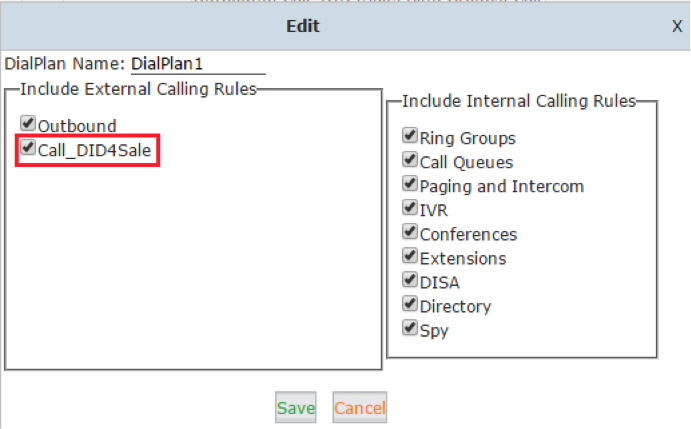 If you want some of the users be able to make outbound calls through this trunk, then please click “New DialPlan” to create a new dial plan, and in this dial plan you enable this dial rule. Then navigate to web menu: Basic->Extensions, edit the extension preferences and select the new dial plan for the extensions. DIDforSale requires 2 extra trunks for fully redundant infrastructure, multiple Trunks are used for Load Balancing and Fail-over. These 2 trunks are for inbound so Outbound CID field can be left blank. If you want the inbound calls calling in from different DID numbers been handled separately, then you can configure number DIDs. Click the Number DIDs tab and click New Number DID button to configure: Fill in the DID number in DID Number field and select a destination for this DID number then if someone calls this number, the call will go directly to the destinations you configured. For other calls will still go to the destination configured in General tab. Click the notice “Settings changed! Please Click on Activate Changes to make modifications effect!” on the top of the web page to activate those configurations. Then you’ll be able to make outbound and inbound calls through DIDforSale VoIP trunks.